As planned, Apple on Thursday kicked off its "12 Days of Gifts" promotion in the U.S. and other participating countries with a download of four songs from Justin Timberlake's performance at this year's iTunes Festival. Timberlake's free single includes four songs performed live at the 2013 iTunes Festival in London and is being offered as part of Apple's holiday giveaway promotion, which is only accessible via the 12 Days of Gifts app found in select iOS App Stores. 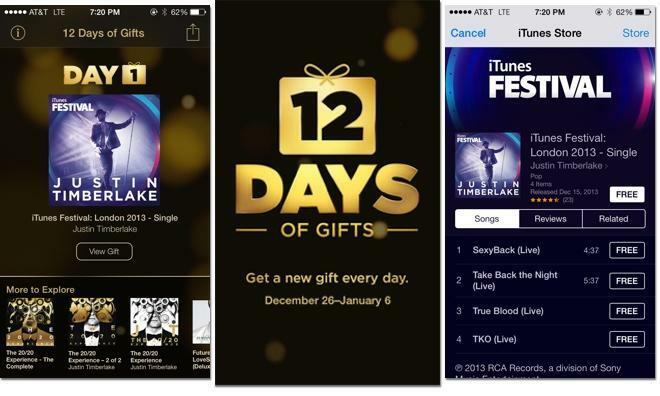 The "12 Days" digital content giveaway has become somewhat of a tradition for many iTunes users, though the app was previously limited to Canada and a few major European countries. For 2013, Apple has extended the promo to U.S. customers for the first time, granting them access to freebies that in the past have included movies, music, e-books, apps and more. Earlier in December, Apple gave away Lorde's latest single "No Better" as a preview for the 12 Days of Gifts app, labeling it as a "gift to get you started." Apple's "12 Days of Gifts" program runs from Dec. 26 through Jan. 6, with each day bringing a free download that will be available for 24 hours. Some content may not be available in all areas. 12 Days of Gifts is a free 64.7MB download from the App Store.